Web Domains, Website Design and maintenance at affordable prices. CUSTOM APPAREL AT YOUR FINGERTIPS, OUR STORE IS ALWAYS OPEN. My ZAZZLE products are fully customizable and the store is open 24/ 7. Does your business have a home on the Information Super Highway? If not you are losing money. A website is always open and working for you. It can introduce you to customers and tell them all about your products too. It can give prices and contact information and tell them when you are open for business, making your life and your customers lives much easier. Pages By Ray can set you up with a world wide ad that is online 24/7. 365 days a year. We can maintain it for you too, leaving you free to run your business while the calls and orders pour in. A website is a full page customizable ad after all. Can you change your Yellow page ad anytime you want? No, but a web page is fully customizable all the time. Every minute you are not advertising you are losing money! 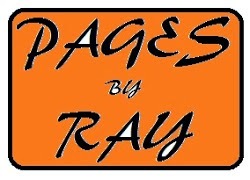 This site brought to you by Pages By Ray! Imagine if your business had a home page like this… Your info. Your Logo…. Websites are better than paper ads because they are available 24/7 and fully adjustable! Pages By Ray can maintain your site for you leaving your time free to run your business! Why arent you on the web??? WEBSITE DESIGN AND MAINTENANCE AT AFFORDABLE PRICES. GET YOUR SITE UP FOR ONLY 100 PER HOUR PLUS EXPENSES.